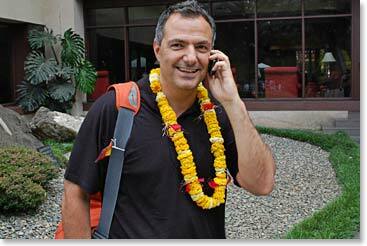 This is Temba calling you from Kathmandu. 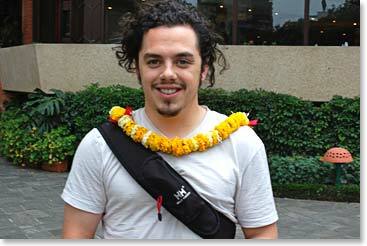 The whole team, Jamie Clarke's friends and the Hanesbrands representatives, Charlie and Alison, has now arrived in Nepal. 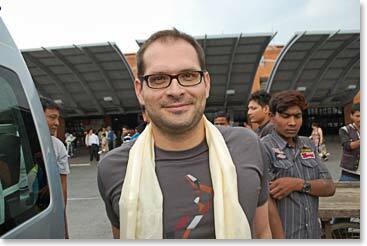 We will stay tonight at the Yak and Yeti and try to stay away from the activities of the strike that is going on here in the city. 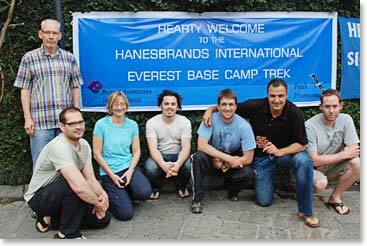 Tomorrow morning we will catch an early morning flight to Lukla and begin our trek up the Khumbu to Everest Base Camp. It will be great to be on the mountain again and away from the city and all its troubles. Take care, and know that we are being safe. Allison Norton-Rimron receives a kata at the airport. 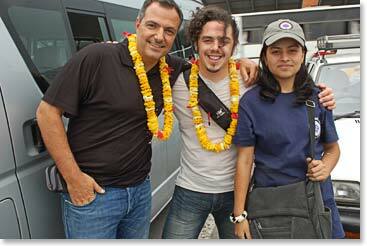 George letting everyone back home know that he's ok.
Rupa welcomes George and Drew to Nepal.